Every spring, China, Korea and Japan suffer from an influx of yellow dust, which originates in the deserts of Mongolia and northern China and is carried eastward on seasonal high-speed surface winds. This natural phenomenon has become a serious problem in the last decades in the Northeast Asia region due to the increase of industrial pollutants contained in the dust and intensified desertification. PM2.5 is the fine-particle matter with a diameter of 2.5 microns or less that is light enough to cross the border through pathways of air and cause damage to the environment in another country. Due to its small size, this type of fine particle penetrates deeply into the alveolar region of the lung and may even be able to cross into the blood, which means that it poses greater health risks than normal particle types. Seoul, a megacity with ten million inhabitants in the Republic of Korea, is one of the affected cities. It strived to lower its emissions of carbon and of fine particles within the city by changing the city bus fuel from diesel to compressed natural gas (CNG). However, as the PM2.5 transported to Seoul from the neighboring countries contributes 35-50 percent of air pollution derived from fine particles, the city needed a joint effort and cooperation with other local governments to unlock the problems. European countries have set an example in controlling the spread of transboundary pollution by implementing the Convention on Long-Range Transboundary Pollution under the United Nations Economic Commission for Europe (UNECE) in the late 1970s. However, due to the different geopolitical climates and economic development trends, no international framework has been constructed to address cross-border air pollution issues at the national level in Northeast Asia. To address this unresolved problem, high-level representatives of 14 of the region’s major cities, including Beijing, Shanghai, Tokyo, and Hong Kong, gathered in Seoul in September 2014. At the Seoul International Forum on Air Quality Improvement, hosted by Seoul Metropolitan Government, the local governments presented their targets for fine particle reduction and announced a joint statement to reinforce cooperation to tackle air pollution in the region. Seoul has pledged to reduce 20 percent of its PM2.5 by 2018, and Beijing and Shanghai by 25 percent and 20 percent by 2017 respectively. It was the first time that local governments in the region voluntarily set significant targets to reduce air pollution for achieving a common goal: cleaning up the skies for citizens. To maintain this momentum in discussions of air quality, Seoul will share its achievements in reducing air quality pollutants with other Northeast Asian local governments at an Air Quality Session during the ICLEI World Congress 2015, which takes place on 8-12 April 2015. 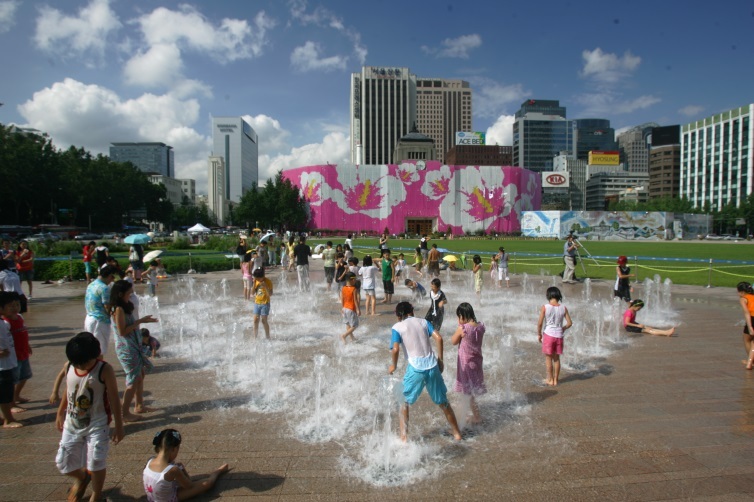 Hosted by Seoul Metropolitan Government, the ICLEI World Congress 2015 will focus on delivering tangible city solutions across areas including low-carbon development; resilience and adaptation; air quality; biodiversity; water; EcoMobility; green urban economy; smart urban infrastructure, and many more. In the Air Quality Session, cities with an advanced track record in addressing air quality will share the technical and economic instruments used to curb emissions across boundaries. Regulation and innovation in transport, industry, and other sectors contributing heavily to emissions form part of the solution. More information about the ICLEI World Congress 2015 and the Air Quality session is available on the website. Having been brought up in Seoul, Jiwon is an Officer at the Capacity Center and supports planning and events of all teams at the World Secretariat.